Traditional Rajasthani women display their upper armlets. As a kid in America, despite growing up with many Indian classmates, there were a number of myths perpetuated about the adornments on Indian women. Some said marital status was indicated by the marking on a woman's forehead or hairline. Others said a single anklet showed a woman was taken. Because India is so diverse, everything I heard and read may be true, depending on the section of the country in question. However, the indicator of marriage for Rajasthani women is irrefutably the series of bands worn on their upper arms. The lack of upper armlets doesn't necessarily mean a woman is single though. Apparently they are cumbersome and unwieldy so many married woman have opted to shed the armlets. 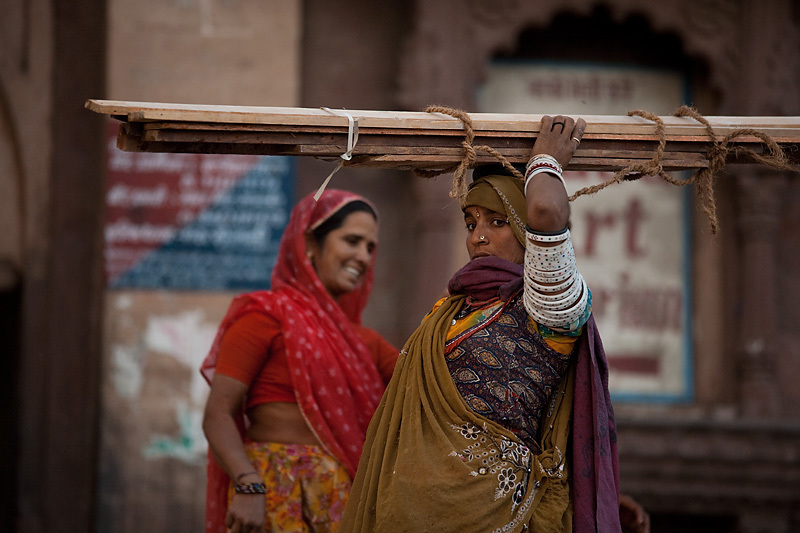 A working Rajasthani woman hauls lumber atop her head. In either of these photos, note the intricate decorations on the various body parts. Noserings, earrings, fingerrings, armlets, bracelets, necklaces, and bindis. I thank the powers that be for making these women so completely photogenic. Because of them, it's difficult to take a bad photo in Rajasthan!